The 25m² (270 ft²) secure block-work building above the cave has electricity newly installed, with mains water and main drainage to within 2 meters and ready for connection. This building could be converted to a studio flat, office, gym or workshop fairly easily and inexpensively. Easy street parking and lovely neighbours! Fully legal with all the relevant paperwork, mains electricity, water, drainage and telephone/ADSL Internet. Very low running costs – e.g. IBI (Spanish Property Tax/Rates) only €12.25 per annum. The property has been completely renovated down to the last square millimetre, including electrics and plumbing. To be sold furnished with new IKEA kitchen, new appliances, new furniture (plus a couple of antiques), even new cutlery, crockery and bedding. You can move in with just a suitcase and a toothbrush! This inexpensive property would be ideal for family holidays. The excellent road network puts Zujar within easy reach of many cities, towns and villages across a vast area – but the cave house is also within an hours drive of Granada, the ski resorts and the beach! 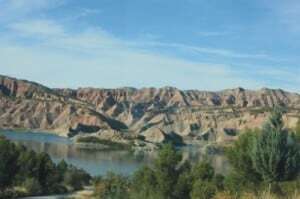 Visit the excellent Andalucia.com website – – for detailed information on the local area and further afield. We love our cave, and the village it’s in, and have spent 8 years renovating it in our spare time. We’ve enjoyed many a weekend there, and had planned to live in the cave full-time – which is why we’ve renovated it to such a high standard. but other interests have forced us to sell. Situated on a quiet residential street within easy walking distance of bars, restaurants, shops, the weekly market (held on Saturday mornings) and the Town Square.Many people would like to own a home in the sun and cave houses of this quality are rare. To find such a property for sale, at such an affordable price, is even rarer. We can accept full- or part-payment to a UK bank; thus removing or reducing Foreign Exchange commission. Thank-you for coming to look at our cave-house. We hope you enjoy the photos and that you daydream a little about living in a cosy cave, or even just taking your holidays in one! If you can’t fulfill your own dreams right at this moment perhaps you know someone who might like to realise their own? Point them to this website and, if they buy, we’ll give you a ‘Thank-you’ of €500. AND they might invite you out on holiday! Please tell your family and friends about our cave-house and share with your Facebook Friends. Visit our Facebook page and, if you’d be kind enough to give us a ‘like’ that would be wonderful and very much appreciated! Thanks in advance.